By the time you get invited out on a market appraisal by a prospective vendor, it’s probably already too late. The seller has a good idea of who she’s going to pick before you even walk through her door. You may be harbouring the hope that you have a one in three chance that you’ll win the business, but the reality can often be very different. Let’s say the seller – Sally – has decided that she’d probably like to use the same agent as her sister used last year, Agent A. But she knows that she should really get three valuations (because ‘that’s what everyone does’) and so Sally also invites Agent B, chosen because they seem to have a lot of sale boards around the town. Now to choose Agent C; Sally will probably go for someone a bit different, perhaps a new startup, or else a nice safe corporate, because they’ve been sending her canvassing cards every month for the last three years. What chances do these three agents have to win Sally’s business? Agent A definitely has the best chance; I’d put them on 70%, because it’s who Sally thinks she’ll probably use. That leaves Agent C, with no chance really, unless he does something exceptional or happens to be the guy Sally had a crush on when she was 14……. otherwise 5% at best is his chance of winning the instruction. When you go in, you don’t really know whether you’re Agent A, B or C, and therefore what your chance is of getting a signup. So how can you make sure that you’re always A, or at worst, B? The answer could lie in social media. 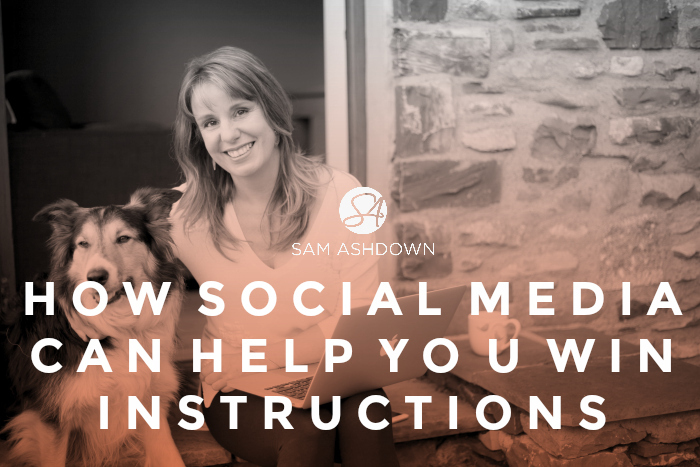 Social media could give you the opportunity you need to start cultivating a relationship with Sally, asking nothing in return, simply being helpful, friendly and generally available online, so she starts to find you a familiar presence in her newsfeeds. The occasional tweet, like and comment will go a long way to building trust. If she feels comfortable with you, Sally may well ask for your advice on something that you can help her with: recommending a plumber, suggesting a nice dogwalk, a restaurant you like. When Sally is ready to think about selling her home, guess who she’ll think of first? The best agents on social media, regardless of platform, share a common trait: they are all friendly, helpful and sociable people. They genuinely enjoy reaching out, chatting to people, and very rarely ask for anything in return. My friend Andy Overman aka @ChilternsLtd recently won the UK’s Best Estate Agent Manager at the Times Awards. He was overwhelmed by messages of congratulations and support by all his ‘friends’ on Facebook and Twitter, and told me he genuinely felt humbled by their good wishes. When you’re as popular on social media as Andy is, what you’ve really created is a community. And that is like gold dust when you’re an estate agent. When are you going to get social?